SMaC Recipe is a concept developed in the book Great by Choice. A SMaC recipe is a set of durable operating practices that creates a replicable, consistent success formula. The word "SMaC" stands for Specific, Methodical, and Consistent. A solid SMaC recipe is the operating code for turning strategic concepts into reality, a set of practices more enduring than mere tactics. It is like the U.S. Constitution, both durable and practical, yet also amendable. Great companies and social enterprises change their SMaC recipe no more than about 20 percent per decade, so a key SMaC question is, What is the right 20 percent to change? [Howard] Putnam [CEO of Southwest Airlines in its early years] didn’t issue some bland, generic “Southwest Airlines will be a leading low-cost airline” vacuous statement. He specified two-hour segments. He specified 737s. He specified 10-minute turns. He specified no air freight or mail. He specified no food service. He specified no interlining. He specified no seat selection. He specified cash-register receipts. Putnam’s 10 points are easy to grasp, articulate, follow, and understand what to do and what not to do. Putnam laid out a clear, simple, and concrete framework for decisions and action. Putnam’s 10 points reflect insight, based upon empirical validation about what works. Take the idea of only 737s. Why would only 737s make sense? All your pilots can fly all your jets, allowing for immense scheduling flexibility. You need only one set of parts, one set of training manuals, one set of maintenance procedures, one set of flight simulators, one type of jet way, one procedure for boarding. But the truly amazing thing about Putnam’s list is its consistency over time. In total, the elements on the Putnam list changed only about 20 percent in a quarter of a century. Stop to think about that for a moment: only a 20 percent change, despite a series of disruptive events from fuel shocks to air-traffic-control strikes, massive industry mergers, the rise of the hub-and-spoke model, recessions, interest-rate spikes, the Internet, and 9/ 11. Yet while stunningly consistent, the recipe also evolved—never through wholesale revolution but in careful steps. Southwest did eventually add flights longer than two hours, embraced Internet booking, and interlined with Icelandair. If Southwest had become rigid, close-minded, uncurious, never amending Putnam’s points as needed, it would not have become a 10X case. Still, what most stands out is how much of the list Southwest kept intact. Howard Putnam’s 10 points form a SMaC recipe. 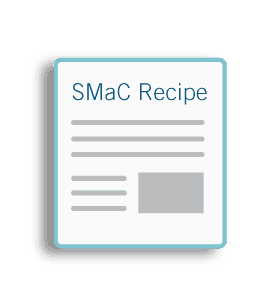 A SMaC recipe is a set of durable operating practices that create a replicable and consistent success formula. The word “SMaC” stands for Specific, Methodical, and Consistent. You can use the term “SMaC” as a descriptor in any number of ways: as an adjective (“Let’s build a SMaC system”), as a noun (“SMaC lowers risk”), and as a verb (“Let’s SMaC this project”). A solid SMaC recipe is the operating code for turning strategic concepts into reality, a set of practices more enduring than mere tactics. In a world full of big, fast-moving forces and unrelenting uncertainty, 10Xers accept with stoic equanimity what they cannot control, yet they exert extreme control when they can. One of the most crucial ways they exert control in an out-of-control world is by being incredibly SMaC. The more unforgiving your world, the more SMaC you need to be. A SMaC recipe forces order amidst chaos. It imposes consistency when you’re slammed by disruption. Operating in a turbulent world without a SMaC recipe is like being lost in the wilderness in the middle of a storm without a compass. Now, you might be thinking, “OK, the primary finding here is to have a SMaC recipe.” But in fact, the existence of a recipe per se did not systematically distinguish the 10X companies from the comparison companies. Rather, the principal finding is how the 10X companies adhered to their recipes with fanatic discipline to a far greater degree than the comparisons, and how they carefully amended their recipes with empirical creativity and productive paranoia.